To test graphics cards for both their power consumption and temperature at load, I utilize a couple of different tools. On the hardware side, I rely on a Kill-a-Watt power monitor, which the PC plugs into directly. 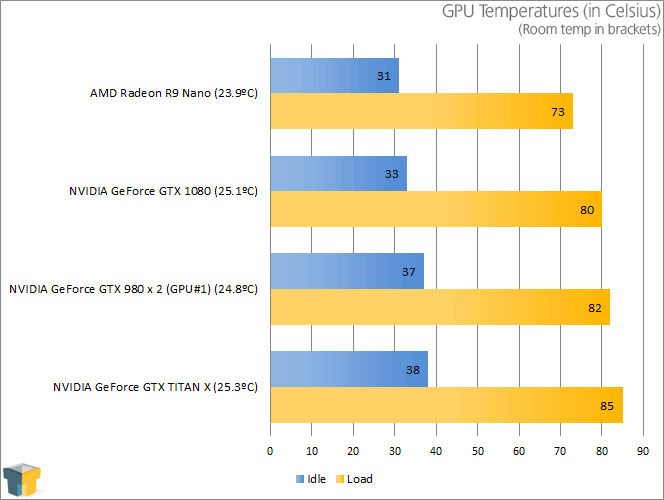 For software, I use GPU-Z to monitor the core temperature, and 3DMark’s Fire Strike 4K test to push the GPU hard. To test, the floor area behind the (shut down) PC is tested with a temperature gun, with the average temperature recorded as the room temperature. Once that’s established, the PC is turned on and left to sit idle for ten minutes. It’s at this point when the idle wattage is noted, and 3DMark is run. It’s during the ‘Graphics Test 2’ that the max load wattage is recorded. Throughout most of our testing, the GTX 1080 has been outperformed by the GTX 980 in SLI. Given that the 980 in itself is a high-end GPU, that’s not too surprising. However, what’s really impressive about the GTX 1080 can be seen in the power graph above. 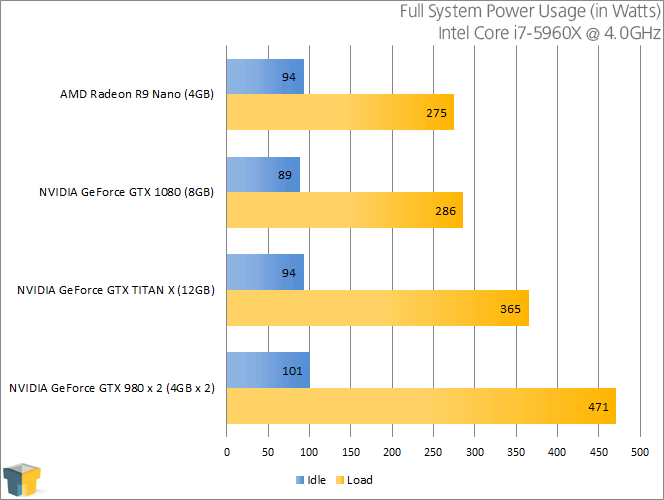 Even though the card can come really close to the performance of SLI’d 980s overall, it draws 185W less at full load. As for temperatures, we were given a tease during the unveiling earlier this month when a demo showed 67°C in the corner. As it happens, that’s not going to be typical, unless, maybe, you have an amazing cooling setup. Instead, the card is likely to peak at 80°C just as the last-generation did. While sub-70°C would have been really nice to see, 80°C is still well within safe limits, and ultimately, it runs hot because it’s delivering the best performance, so there’s nothing to stress over. Even so, I am anxious to see what third-party coolers could do for the GTX 1080’s temperatures. Considering the fact that NVIDIA left little to the imagination when it unveiled the GeForce GTX 1080 in Austin earlier this month, and the fact that the performance seen in our testing largely matches up with what we expected, this is one card that’s seriously easy to write a conclusion for. There are a couple of different ways to look at the GTX 1080. NVIDIA’s Jen-Hsun gave us a great example during his keynote a few weeks ago: It’s faster than a TITAN X, uses less power, and is cheaper. Through our testing, we’ve been able to establish that those promises were true. Is the card faster than 980s in SLI, though? The answer to that is “sometimes”. If a game takes proper, full advantage of SLI, it’ll likely be a bit faster than a GTX 1080, but not by much. In some cases, the GTX 1080 even wins if SLI is taken advantage of. As much as NVIDIA likes to talk about the TITAN X in its Pascal comparisons, I think a fairer comparison is the 980 Ti, as that’s the card most people own (out of the two). The GTX 1080 is at least 25% faster than the TITAN X, so that means it’d be at least 35% faster than a 980 Ti. 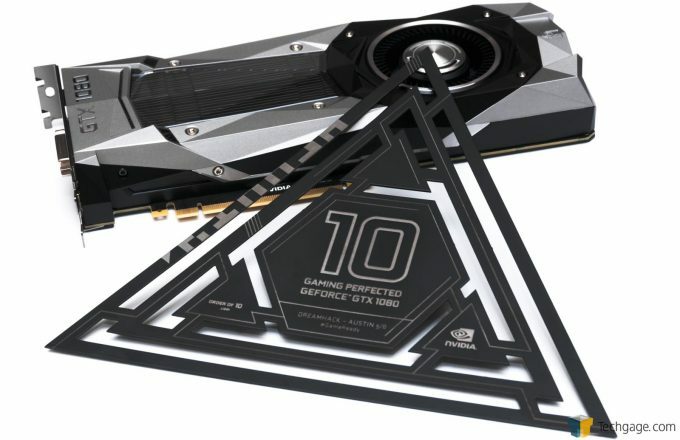 That card cost $649 a few weeks ago, so with the 1080, NVIDIA delivers a card that’s much faster, still cheaper (SRP $599), and uses far less power. The same applies to the GTX 980; two of those right now would cost more than the GTX 1080, and while it might be faster (in some cases), it’s a much bulkier setup that delivers a much-decreased performance-per-watt rating versus the 1080. Any way you look at it, the GTX 1080 delivers just what we hoped Maxwell’s successor would. It is unfortunate that we didn’t get all of the candy that comes with full-blown Pascal, like NVLink and HBM2 memory, but thanks to its transition to 16nm FinFET, NVIDIA has proven that the actual need for HBM2 right now is not that great. Although, AMD could punch a hole in this theory if its first Polaris cards do in fact ship with HBM2, and with larger than a 4GB framebuffer. 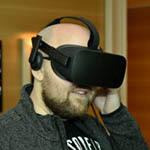 Outside of boosted performance, NVIDIA introduced a number of cool technologies with Pascal, including Async Compute, multi-GPU support in Windows 10, a collection of comprehensive VR improvements, multi-monitor gaming improvements, and has updated existing ones, like GPU Boost. It’s even improved the overclocking aspect, giving those who want to push their card more dials to play around with. 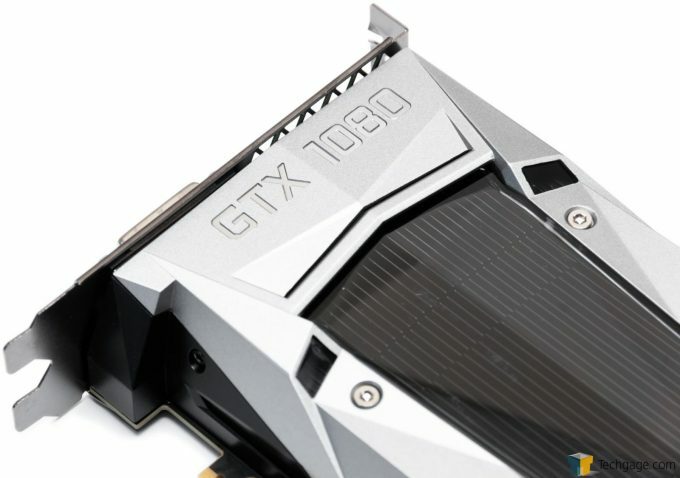 After taking a look at our performance results, and poring over all that Pascal brings to the table, the GTX 1080 earns, without hesitation, one of our Editor’s Choice awards. There is one thing I will admit, though. Based on what’s been revealed, I feel like the GTX 1070 is going to be the even more exciting release of the two, as it’s pretty affordable (at $379 SRP), and looks to surpass the performance of the TITAN X (it’s spec’d at 400 GFLOPs higher). The 1070 still only makes use of GDDR5, rather than the new G5X, but since the TITAN X also used GDDR5, this isn’t too much of a concern. Now consider this: A $600 GTX 1080 is going to deliver 9 TFLOPs of performance, whereas dual GTX 1070s would gain 44% theoretical performance for just $160 more. Of course, if money is of little concern, you’re also free to go the 1080 SLI route to gain 38% over SLI’d 1070s. It’s nice to have choices! As mentioned earlier, this launch article will not conclude our GTX 1080 coverage. We have more stuff planned, although some of that might wait until the GTX 1070 drops so as to kill two birds with one stone. For further reading, you can now check out our GTX 1080 overclocking guide and best playable settings. The fastest performing single GPU on the planet. Great for overclocking (more on that soon). Supports a bunch of new features (Ansel, SMP, Fast Sync). Outperforms TITAN X, but costs much less and uses less power. Initial DirectX 12 performance is good. We still have to wait for HBM2 and NVLink. You can (pre)order the new NVIDIA GeForce GTX 1080 from either Amazon or Newegg when available (check back often). We’ll be sure to check out custom cooler and overclocked models soon.